"How do I start a small business" or "How can I be an entrepreneur" has come across most everyone's mind. Starting a small business is not difficult at all. All that's needed are information & motivation! Whether you've wondered how to start a home based business or a large corporation, inside you'll find easy to read and understand directions on how to start your own small business. 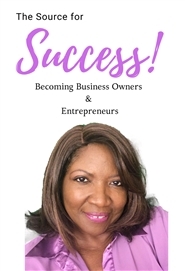 The Source for Success: Becoming Business Owners & Entrepreneurs will provide step by step instructions to start you on the path to business success! Each module is based upon the Word of God, which promises good success!